TOKYO -- Tokyo Star Bank, acquired in 2014 by CTBC Bank, one of Taiwan's largest financial institutions, frequently receives inquiries from individual Taiwanese investors wishing to invest in Japanese real estate. In fact, the Tokyo bank, which was bought for 53 billion yen ($438.67 million) in June last year, has become a gateway to Japan for Asian investors. Tokyo Star Bank last December began offering loans to Taiwanese clients to purchase real estate in Japan. Under the new program, borrowers living in Taiwan are able to receive up to 500 million yen from the bank at low interest rates of around 2% thanks to the Bank of Japan's bold credit easing. A government survey found that commercial land prices in Japan stopped falling year-on-year for the first time in seven years in the 12 months to Jan. 1. Recovering land prices are partially attributable to an inflow of funds from overseas investors as the value of Japanese real estate became more attractive on a weaker yen. Real estate deals in Japan totaled 5.06 trillion yen in 2014, up 16% from the previous year, according to Urban Research Institute. 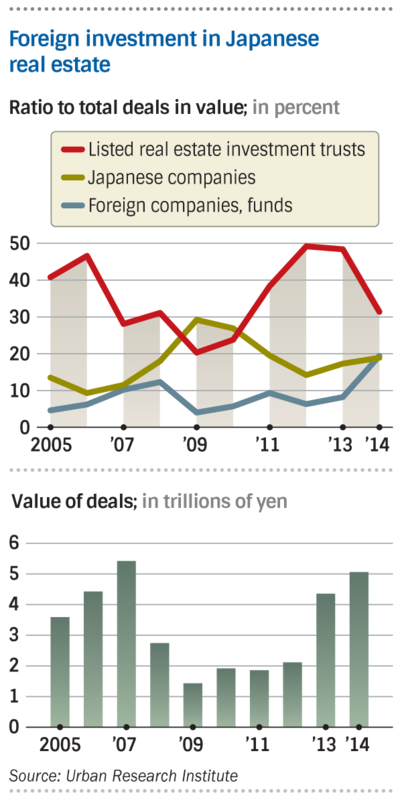 In particular, transactions involving foreign companies, such as investment funds, soared 2.7 times to almost 1 trillion yen. With the yen plunging in value by 14% against the dollar last year, Japanese real estate is attracting investors from overseas. Property purchases by international investors are growing in scale as well. In October last year, Singaporean sovereign wealth fund GIC acquired the office component of the Pacific Century Place Marunouchi building in Tokyo's central business district for 170 billion yen. French insurer AXA Group purchased Nakano Central Park East, a large office building in the capital's Nakano Ward, for 37 billion yen. The BOJ's extensive easing of credit has made domestic funds available for real estate investment, too. Unlisted private REITs are rising rapidly among the real estate investment trusts purchasing properties with investor capital to earn profits from rental fees and other revenue. The value of assets held by private REITs, which pay relatively high yields averaging around 4%, topped 1 trillion yen in February, according to Sumitomo Mitsui Trust Research Institute. Unlike listed REITs, private REITs solicit capital from financial institutions and other professional investors. In particular, they collect large funds from regional banks struggling to use their capital more efficiently due to a shortage of borrowers. Of the 1 trillion yen assets held by private REITs, regional financial institutions accounted for nearly 20%, or 180 billion yen, up 70 billion yen from April last year. Private REITs provide "one of a few ways for banks to earn returns in the scarcity of viable investment options," said Daiwa Securities analyst Maoki Matsuno. But real estate investments also have risks. Nippon Building Fund, Japan's largest REIT, purchased no real estate in the year ended in December because "prices were found rising considerably in Tokyo after analyzing a significant number of properties," said Kenichi Tanaka, president of Nippon Building Fund Management. While Singapore's GIC purchased a property in front of Tokyo Station, an executive at a major Japanese real estate company said the deal "presupposes considerable rises in rents." Another risk is that speculators may withdraw their funds from Japan if the depreciation of the yen comes to a halt. Japan was said to be in a "mini bubble" in 2007 when the value of real estate deals topped 5 trillion yen. The property market then took a bad turn because of the global economic downturn the following year. If recent real estate investments are speculative, they will not lead to a stable recovery in land prices.